In 1867 civic leaders William LeDuc, John Meloy, Stephen Gardner, E. D. Allen, and P. Van Auken—with financial backing from investors John B Alley, Oliver Ames, William Ames and Peter Butler—incorporated the Hastings & Dakota Railway with the goal to "cross the Rocky Mountains and meeting the Pacific Ocean". During the 1870s the H&D was completed from Hastings all the way to the South Dakota border at Ortonville. During this time, the H&D became part of the Chicago, Milwaukee & St. Paul Railroad ( Milwaukee Road) and become known as the H&D Division of the Milwaukee Road. The H&D also built the famous "Lake Street Depression" in Minneapolis, which gave the H&D two districts around Minneapolis and St. Paul: the south district from Hastings to Cologne via Chaska, and the north district from Hastings to Cologne via St. Paul/Minneapolis. While the H&D never made it to the Pacific on its own, the H&D Division became the mainline of the Milwaukee's Coast Extension to Seattle, which the Milwaukee completed in 1909. According to the United States Census Bureau, the city has a total area of 11.18 square miles (28.96 km2); 10.24 square miles (26.52 km2) is land and 0.94 square miles (2.43 km2) is water. The Mississippi River forms most of the northern border of Hastings, while the Vermillion River flows through the southern part of town, over a falls adjacent to a ConAgra grain elevator. Bluffs lie along the northern shore of the Mississippi River and there is a gorge surrounding the Vermillion River below the falls. Hastings is home to two small lakes, Lake Rebecca and Lake Isabel. Both drain into the Mississippi River. The northeast corner of town is known as "The Bottoms"; an area of soggy marshland and flood plain for the Mississippi and Vermillion Rivers. As of the census  of 2010, there were 22,172 people, 8,735 households, and 5,802 families residing in the city. The population density was 2,165.2 inhabitants per square mile (836.0/km2). There were 9,222 housing units at an average density of 900.6 per square mile (347.7/km2). The racial makeup of the city was 94.1% White, 1.6% African American, 0.5% Native American, 0.9% Asian, 0.8% from other races, and 2.1% from two or more races. Hispanic or Latino of any race were 2.6% of the population. As of the census  of 2000, there were 18,204 people, 6,642 households, and 4,722 families residing in the city. The population density was 1,798.2 people per square mile (694.5/km² ). There were 6,758 housing units at an average density of 667.6 per square mile (257.8/km²). The racial makeup of the city was 97.16% White, 0.43% African American, 0.38% Native American, 0.64% Asian, 0.04% Pacific Islander, 0.36% from other races, and 0.99% from two or more races. Hispanic or Latino of any race were 1.14% of the population. 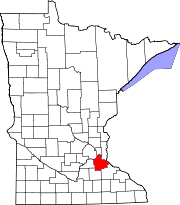 Highway 291 ( Minnesota Veterans Home Highway) is a short, one mile roadway on the east side of Hastings that lies host to a Minnesota Veterans Home. Highway 291 is also known as East 18th Street and Le Duc Drive in Hastings. The roadway crosses the Vermillion River. On the same site of the Veterans Home are two drug and alcohol facilities; the first a sub-acute hospital called Dakota County Receiving Center, otherwise known as Dakota County Detox Center. The center was the first of its kind in Dakota County founded in the early 1970s by Bruce Foster. The other is the Cochran Halfway House.